We are happy to announce that our first about us video is complete! We are now able to showcase what we can do for our community and clients. We hope that you will take the 45 second run time to take a look at it and provide feedback. We appreciate your time and opinion. We are here to help you become the best version of yourself! There are other wonderful videos on our channel. If you feel moved please take the time to like our channel and take a look around. If there is a topic that you would like to know more about please let us know. We take requests. Feel free to contact us, and visit us at www.counselflorida.com. 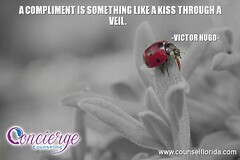 Concierge &VIP Counseling appreciates your support. Please find us on Facebook or Twitter for relevant material and motivation @PSYCHConcierge. You can also access our entire gallery of FREE picture Quotes on FLICKR by clicking here.